Properties satisfied by the moments of the partial non-central chisquare distribution function, also known as Nuttall Q-functions, and methods for computing these moments are discussed in this paper. The Nuttall Q-function is involved in the study of a variety of problems in different fields, as for example digital communications. Gil, A, Segura, J, & Temme, N.M. (2013). 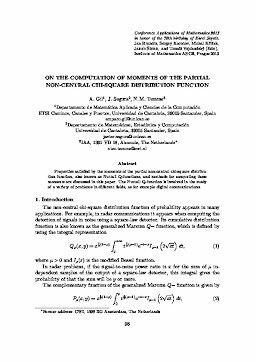 On the computation of moments of the partial non-central chi-squared distribution function.